The bill of lading is one of the most important pieces of documentation in the shipping industry. But in its long history, the process has barely changed. Now, new digital technology such as blockchain could be about to revolutionize the transport document. Alongside insurance policies and invoices, bills of lading are an essential document in global trade. They serve as an official agreement between multiple parties and provide legal evidence of receipt of goods. However, with the majority of these documents still issued on paper, the process can be cumbersome. They typically take five to ten working days to reach their destination. 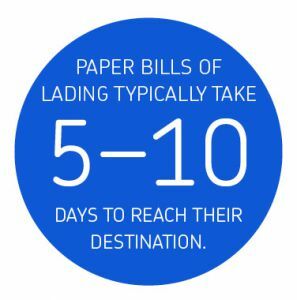 Numerous issues can arise from paper bills of lading. For example, if the cargo arrives at its destination before the document, the carrier is left with two options. Either they hold the cargo until the document arrives, causing lengthy delays, or they deliver the cargo in good faith. The latter option is risky, however, as lack of evidence would void the carrier’s protection and indemnity (P&I) insurance. To overcome these issues, numerous carriers have switched to electronic bills of lading. These replicate the core aspects of a physical bill of lading, but bring several benefits. Firstly, there is less risk of the bill of lading being delayed or lost in transit; an e-bill can be sent around the world instantly. It is also cheaper and easier to make corrections to the digital document, if necessary. Despite these advantages, e-bills have not become as widespread as might be expected. This is largely due to the fact that, in order to use them, there must be agreement between all parties involved. And, as with digital systems of any kind, there is always a risk of hacking, viruses, or system failure. However, the potential of digital bills of lading seems too good to ignore, and a number of companies are now developing solutions for the maritime industry based on blockchain. Blockchain is a distributed digital ledger of transactions. Information stored in a blockchain is shared, meaning it is transparent, easily verifiable, and cannot be controlled by a single entity. Originally developed as the technology behind the digital currency Bitcoin, blockchain is now being used for numerous diverse purposes. These range from land registration and supply chain management to smart contracts. Could blockchain make the breakthrough? Blockchain technology has the potential to enable trading partners to exchange transport documentation without intermediaries and without paper. For this reason, several shipping companies are testing the possibilities of blockchain-based bills of lading to streamline the process. Such bills of lading would be automated and based on a decentralized, secure network. The technology could also facilitate secure interactions between suppliers, distributors, and regulatory bodies. By linking payment processes to blockchain, suppliers have assurance about when they will be paid. Blockchain-based bills of lading promise to reduce the risk of fraud and errors, increase transparency, and accelerate the shipping process. However, it still remains to be seen whether this innovation will be widely adopted by shipping companies. In any case, there is potential for the maritime industry to become more efficient by digitizing its processes—and the more the technology proves itself, the more companies will adopt it.